April 3rd, 2018, Charlottetown – Island short track speed skaters came up big at the Canada East Short Track Speed Skating Championships in Lévis, Quebec last weekend. The P.E.I. contingent grabbed three medals and a handful of new provincial records in the event which brings together 128 of the top young speed skaters from Quebec, Ontario, Atlantic Canada and Nunavut. Andrew Binns (left) won PEI’s first ever gold medal at the Canada East Short Track Championships in Lévis, Quebec recently. Photo courtesy of Kristen Binns. Andrew Binns brought home P.E.I.’s first ever gold medal, along with a bronze, from the Canada East event, while William Lyons of Rock Barra garnered a silver medal for the Island team of six skaters. Four members of the P.E.I. squad cracked the top ten overall in their respective age categories – the most ever top ten finishes by Islanders in the event. “This weekend was a super finish to our team’s season,” said P.E.I. coach Sarah Taylor. “We had an extremely strong team last year and even with a slightly smaller group competing this time, we had more top ten finishers than ever. We executed many of our races even better than last year, but didn’t always get the same breaks, which can make a big difference in short track. Seeing how our skaters were able to reset and focus on their next races after any setbacks was very encouraging. As the team reflects on this weekend, I think they’ll be quite pleased with their performances. Even with our small population, we’re building a strong program with athletes that can compete anywhere in Canada and it’s getting noticed. It’s an exciting time to be involved in speed skating on P.E.I.,” said Taylor. Binns nabbed gold in the 200 metre sprint event, clocking the only sub-20 second time in his age category and breaking his own P.E.I. record for 14-year-old boys in the distance, after stopping the clock at 19.938 seconds. The Stratford native finished third overall in his age group, also earning bronze in the 400 metre event, bettering his own Island record time in the process. With the gold medal this year, Binns now has a complete set from the Canada East event, after picking up silver and bronze medals in Ottawa last season. Lyons picked up the silver in an exciting and hard-fought relay event, where he teamed with three New Brunswick skaters in the 12/13-year-old boys 3000 metre relay. Skating against three Quebec teams in the final, the Kings County skater and his maritime counterparts overcame a dramatic crash involving Lyons and two other skaters – including another of Lyons’ own team members – leaving them short one skater after a race stoppage and re-start with 25 laps remaining. In skating to the silver medal win, Lyons became the first Islander to earn a relay medal at the Canada East event. He had his best individual finish in the 2000 metre points race, placing fifth. Lyons finished seventh overall in the 13-year-old boys category. Kyle Connell set a pair of new P.E.I. records for 15-year-old boys and finished a strong fifth place in the 400 metre distance, enroute to a seventh-place overall ranking. The Charlottetown skater lowered his own provincial record times in both the 400 metre and 1500 metre distances and was instrumental, along with Binns, Thomas McQuaid and Carter Bruce, in propelling the lone Island relay team to a new P.E.I. record, B final win and fifth overall in the 14/15-year-old boys relay. The Island relay unit, with a time of 4:41.609, took more than 16 seconds off the provincial mark set just last season by Connell, McQuaid and Matt Kozma and had the fastest time of all non-Quebec based teams. Liam Chatfield had a strong debut in the Canada East event, finishing ninth overall among 12-year-old boys and joining a select list of Islanders who have posted top ten overall finishes at the Championships. 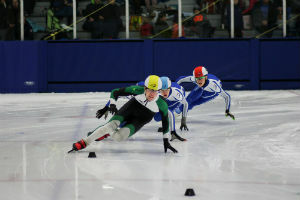 The Charlottetown skater had his best finish in the 200 metre distance, placing seventh, while also shaving nearly a second from his personal best (PB) time in the 400 metre distance. Thomas McQuaid and Carter Bruce, in addition to their part on the record setting relay team, both set new PB times during the competition. McQuaid posted PBs in all three of his timed distances while finishing 12th among 15-year-old boys, while Bruce set a new PB time in the 400 metre distance on his way to 13th place overall among 14-year-old boys. With its two individual medals, P.E.I. finished tied for third with New Brunswick in the medal count, behind Ontario with six and Quebec skaters who earned 97 of the 108 medals. For more information and full results from The Canada East Short Track Speed Skating Championships, visit www.speedskatepei.ca.